Prambanan, named after the village, is the biggest temple complex in Java. There are 224 temples in the complex; three towering temples on the central terrace dominate the complex. Those are Brahma Temple in the North, Visnu Temple in the South and the biggest among the three which lies between Brahma and Visnu is Çiwa Temple which soars up to 47 meters high. Prambanan attracts many admirers each year from abroad. Situated about 15 km from Yogyakarta, the top of the main shrine is visible from a great distance and raises high above the scattered ruins of the former temples. Prambanan is the best seen shortly after dawn or in the late afternoon. However it is still beautiful at any time. Ancient Java’s greatest empire, The Mataram, first appeared on the stage of history in 732 AD, the year Sanjaya, a Hindu noble, established territorial rule over the fertile plains between the Progo and Opak rivers. In 750 AD, the Buddhist Syailendra dynasty overthrew Sanjaya, whose family and followers were exiled to the highlands on the periphery of Mataram. A century later, Rakai Pikatan, a descendant of King Sanjaya married into the Syailendras and rose to power. With his ascendancy came the rebirth of Hinduism and a new spate of the temple building, most notably the construction of Prambanan’s Roro Jonggrang complex. Sanjaya Dynasty, a Hindu noble, established territorial rule over the fertile plains between the Progo and Opak rivers. The dynasty, in keeping with Hindu tradition, set him up as a semi-divine link between heaven and earth. To secure this status for eternity, and to unite the populace in a massive communal effort, he and his successors embarked on a centuries-long program of constructing religious monuments. The earliest Central Javanese Temples date from this period, including the foundations of the great Borobudur. Prambanan Theatre on the next site of the world heritage archeological park of Prambanan temple is one of the world class arts centers, officially opened on 1990. This architectural icon with its distinctive Prambanan view is sited within Yogyakarta’s civic district, just about 15-30 minutes of down townYogyakarta. Prambanan Theatre aims to be a performing arts centre for everyone, and its programmes cater to its diverse audiences. Ramayana Ballet and its programmed line-up span all genres to encompass music, dance, theatre and visual arts, with a special emphasis on Asian culture. Presented by more than 250 artists at its original place: Ramayana Open Air Theater & Trimurti Theater Prambanan Temple complex – Yogyakarta – Indonesia. Ramayana Ballet at present time being the most popular performance in Yogyakarta. It is held at an outdoor theater (episodic and full story) and Trimurti indoor theater (full story) in Prambanan, 16 km east of Yogyakarta, with the magnificent Prambanan Temple as a scenic background. Ramayana Ballet presents the finest dancers from the region. To gain admission to the venue, please produce tickets at the entrance. All audiences are required to have ticket. The history of Ratu Boko, begin with Prambanan are a large number of inscription dating from the second half of the eight century to the middle of ninth century have been found on Ratu Boko hill and at the Kalasan, Loro Jonggrang, Sewu, Plaosan and other candi. In particular, the Sanskrit inscription dated in 856 AD is important. From them it can be summarized that the Buddhist Shailendra dynasty and the Hindu Mataram often cooperated with one another but that in the middle of the ninth century the later defeated the former. When we heard the word Kraton (Palace), our imagination will automatically think about Rakai, Palace and the Royal facilities. But those that we imagine can’t be found at Ratu Boko Kraton, when it was found, and who gave the name. According to the ancient inscription that was made by Rakai Panangkaran in 746-784 AD, at the beginning the building around Ratu Boko heritage site is called Abhayagiri Wihara. Abhaya means no danger or peace. Abhayagiri means the Buddhist monks dormitory/wihara that is located at the peaceful area on top of the hill. In the next period between 856-863 AD, Abhayagiri Wihara changed its name became Walaing Kraton that is proclaimed by Vasal Rakai named Rakai Walaing Pu Kumbayoni. Mandyasih inscription, which was built in 898-908 AD by Rakai Watukara Dyah Balitung, still mentioned Walaing as the pedigree of Punta Tarka who made Mantyasih inscription. From the beginning of 10th century until the end of 16th century, there is no news about Kraton Walaing. The Shailendra stronghold at that time was Ratu Boko hill, and three kinds of “lingga” were erected to commemorate the Mataram victory. 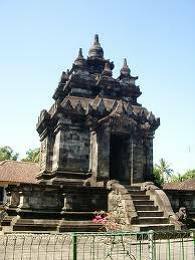 Prior to that, “candi Siwa” probably meaning candi Loro Jonggrang, was built. Much still unknown, but more and more of the history of that time will no doubt come to light in time with the discovery of more such inscription if they are carefully preserved. For those who love, within the mind’s eye to reconstruct history, Ratu Boko is a dream. The main site is on a small plateau. The trek is best done at dawn or in the late afternoon when the views from the plateau’s ridge are most beautiful. Ratu Boko was probably a fortified palace built by the Buddhist Sailendra and later taken over y Hindu Mataram. Little remains apart from a huge, sparsely ornamented gateway and a series of foundations and bathing places, but the atmosphere are enchanting. A few hundred meters to the south on another small plateau (linked with the first, but difficult to find) is a large stone platform with decorated waterspouts and staircases surrounded by an empty moat; a little below the platform, through kala-head gateway, is a group of tranquil green pools, one of which is still used by the villages. According to HJ. DeGraff, in 17th century there were many European travelers who came to Indonesia. 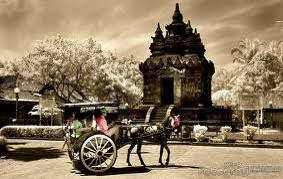 Those travelers said that there was also a heritage site which mentioned about Prabu Boko who came from Bali. Ninety years later, in 1790. Van Boeckholtz found the heritage ruin above Ratu Boko heritage sites. The Publishing of this founding attracted scientists like Makenzic, Junghun and Brumun who came to visit and made recording about the heritage site at Ratu Boko Hill in 1814. One hundred years later, FDK Bosch made a research and reported it which entitled “Kraton Van Ratoe Boko”. According to FDK Bosch, the site at Ratu Boko Hill is known as Kraton Ratu Boko. People who live around Ratu Boko Hill usually call it as Dawun, temple just like the name of their village. That is why in some literatures and old maps, Ratu Boko Hill is written in 2 (two) name: Dawung Temple and Kraton Ratu Boko van Ratoe Boko. The name of Kraton Ratu Boko comes from the word Kraton van, Ratu Boko. Kraton is from Ka-da-tu-an that means King’s or Rakai’s Place. Ratu Boko comes from the word Ratu which has the meaning as King and Boko is heron. This understanding comes up with question whether the King of Heron is the ruler himself or the real bird. Therefore, people say that Ratu Boko keeps a mystery up to now. A spectaculer show takes you on a sensory odyssey through magnificent live performance of traditional Javanese dances and sound. You will be flashed back in history during a time when this ancient wonder of the world was once centre of powerful empire. Describes the Galuh Kingdom that holds a great audience to the sultan ( Pasewakan Agung) attended by the king of Galuh,the Queen, Prince Pancapana and Prince Sanjaya, the Grand Vizier and other kraton officials, to discuss the royal succession, but shocked by Pancapa, the eldest son of King Galuh, who bids farewell, leaving the kingdom to embark on an adventure. Pancapa, accompanied by his faithful ervant, Dharmajaya, travel eastwarf, and mets an elder named Ki Wasesa. In this encounter, Ki Wasesa shows a place by the lakeside below the Boko Hill. The Boko’s people are performing their activites,and then comes Pancapana, followed by Dharmajaya. Ki Wasesa appears, notifying them of Pancapana`s arrival, which they welcome well. The party of Prince Sanjaya, Pancapana`s younger brother, in search of his long lost brother, meets an elder named Ki Wasesa in the journey. He then takes the party to the place where Pancapana lives. From this encounter, Ki Wisesa then knows that Pancapana is actually a king`s son on a journey. Prince Sanjaya begs Pancapana to return to the kingdom, but Pancapana refuses and wishes to stay in the Boko Hill. Then Pancapana begins to be known as a wise youth respected by the people. Mendut is a temple religious backgrounds Buddha. This temple is located in the village Mendut, District Mungkid, Magelang Regency,Central Java, A few kilometers from the temple Borobudur. Actual temple building materials are brick covered with natural stone. The building is located on a basement high, so that it looks more elegant and sturdy. Up stairs and the entrance facing southwest. Above basement There are tunnels around the temple body. The roof and decorated with three storied stupa-Small stupas. The number of small stupas built now is 48 units. Building height is 26.4 meters. Decoration found on a decorative Mendut intermittent. 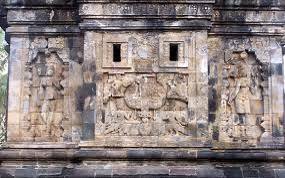 Decorated with carvings of celestial beings and angels Gandharva, two-tailed macaques and a lone eagle. On both banks of the stairs there is a relief-relief storiesPancatantra and Jataka. Boddhisatwa temple reliefs decorated the walls of which Awalokiteswara, Maitreya, Wajrapāṇi and Manjusri. On the wall of the temple there is a relief Kalpataru body, two angels, Hariti (ayaksi who repent and then follow the Buddha) and Āţawaka. Buddha in a position dharmacakramudra. Inside the temple there are statues of Buddha holding a large amount to three: namely Wairocana Dhyani Buddha’s hand with an attitude (mudra) dharmacakramudra. In front there is a relief in the form of statues of Buddha flanked by a pair of wheels and a deer, a symbol of the Buddha. On the left side there are statues Awalokiteswara (Padmapāņi) and the right statue Wajrapāņi. Now in front of statues of Buddha placed incense, incense and baskets to donate. The visitors could light a incense and prayed here. 1897 – 1904 legs and body is repaired but the results are unsatisfactory. 1908 – Corrected by Theodoor van Erp. Peaks can be rearranged. TEMPLE Mendut for Buddhists have a special meaning. The existence of three large Buddhist statues in this temple has a beauty that is very high both in my physical form as art. All three statues of Buddha in this temple is considered still emits light of holiness. So that among the Buddhists of this temple became a place of prayer that helped him. Buddhists not only domestically, but also from abroad. As performed, Ny. Shizuko Miyagawa, Buddhist sect Nyoi Shin Ken Kei of Japan, has been granted his petition praying to God Almighty that are being said at the altar of this temple Mendut. That prayer is a request for healing for her child merely puppets, Tsuyoshi Miyagawa, who suffered severe enough and not go away despite the many relief efforts have been made in his country there. This occurred in the 1980s. As expressions of gratitude to God almighty for his son’s recovery, Ny. Miyagawa and then build a monument ‘Friendship in Indonesia – Japan,’ which is now still standing in the yard beside the house Pak Kosim (deceased), west Mendut. The monument which was inaugurated in February 1985, the form of a bronze plaque and stone pillars that marked the Merapi andesite Japanese characters. Buildings ‘tetenger’ from Mrs. Miyagawa was made by Dulkamid Djayaprana, a sculptor from Prumpung Muntilan. Buddha statues inside the chamber is Mendut, statue or Vairocana Cakyamuni Dyani Buddha, Buddhist statues or Lokesvara Avalokitesvara, and Vajrapani Bodhisattva statue. Cakyamuni Dyani Buddha statue facing west (located in the center), sitting with his legs position nudge down, trod on a lotus-shaped foundation. Attitude hands ‘dharmacakramudra’ meaningful’re playing ‘wheel of life’. Avalokitesvara Bodhisattva statue is located on the north side Dyani Buddha statues Cakyamuni, facing south. This statue is depicted in a sitting position, legs folded into the left and right leg dangling down. Attitude hand, ‘varamudra’ meaningful’re giving or delivering courses. This Avalokitesvara Budhisatva Pengarcaan greatness by wearing jewelry in the ears, neck and shoulder chocolate, and wearing a crown. And Vajrapani Bodhisattva statue which is located to the left of the statue of Buddha Sakyamuni facing north, is depicted wearing oversized clothes as Avalokitesvara Bodhisattva statue. Pengarcaannya with a sitting position, right leg folded with your feet touching the thigh, left leg dangling down. Mendut building standing on the ‘basement’ (the base of the temple) as high as 3.70 meters, so look classy, strong and authoritative. Basic size of the temple 13.70 meters x 13.70 meters. The number of temples there are 14 levels up traps, facing northwest. Toward this direction is unusual for temples in Central Java. 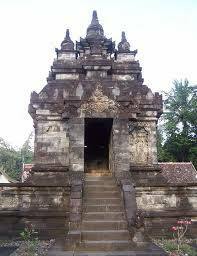 Because in general the temples in Central Java, facing east. In the basement there is the hallway that surrounds the temple body width 2.48 meters. The rooftop of the temple consists of three levels decorated with small stupas totaling 48 units. From the image reconstruction, the temple was originally there top of the temple. But alas, the peak of the beautiful temple until now has not been successfully reconstructed. Building stones and ornaments of stone temples that have not been able to go back now neatly arranged in the courtyard of the temple to the north. Now this temple building height 26.50 meters. Indeed Mendut other temples in Indonesia. As a Buddhist temple, this temple has a special attraction. Not only the existence of a large statue of Buddha, this temple is also decorated with reliefs depicting Jataka stories-stories, is loaded with legal meaning of the teachings of ‘Cause and Effect. “Relief-relief is engraved on the outer wing panels ladder section below. Relief on the right describes the story, the tortoise is in danger rescued by a crane and two small. It turned out that a crane was deceiving the tortoise. Salvation, the turtle was brought to bite a stick two birds flying bango it to take to a lake. Because the tortoise tricked, he dared to fight the bird by biting his neck. Then the birds died because of his evil deeds. Relief fable stories (stories with animal characters), the other in another panel, tells about a monkey who helped and diseberangkan a crocodile. The monkey climbed on the backs of crocodiles. Actually the crocodile wants to eat liver apes. Crocodiles stopped in the middle of the river, and wanted to tear the stomach monkeys with sharp teeth. But with the clever monkey told the crocodile that he was left on the other side of river. And that stupid crocodile believed talk of apes, which then ruled the monkey to keep him up to the opposite bank. Arriving across the river, the monkey jumped to save themselves. On the other reliefs depict stories, an elephant who became violent when in their midst who were convicted of crimes. But the elephant is a gentle and docile when it was near the hermits, the bhiku, the atmosphere is quiet and shady. And much more relief from the fable stories Jataka stories are carved in this temple. Because of this temple was built not only as a place of worship and contemplation, but also as a place to deepen the teachings of the Buddha for the believer. On the right side entrance to the temple (north side), there is a relief Kuvera. These reliefs depict Kuwera god, the god of Wealth. Depiction, there is a man who sat surrounded by children. Beneath it were jars filled with money. It seems, at first Kuvera is a giant man-eating savage. But after meeting with the Buddha’s teachings and given the lofty moral and character, he repented and changed temperament to be protective of children. On the left side (south side) entrance to the temple, reliefs terpahatkan Hariti a lap child. Hariti around so many children are playing. Like Kuvera, beginning raseksi Hariti also a man-eating, and after a conscious and repent turn into protectors of children after the encounter and was given by the Buddha’s teachings of kindness. Even Hariti also known as the Goddess of Fertility. The temple is located in The Village Mendut Mungkid City area is approximately 3 kilometers east of the Borobudur Temple. Until now not known with certainty, when the temple was built. Drs. Soediman in the language manual juicer, ‘Chandi Mendut. Its relationship with pawon and Borobudur ‘wrote, in his dissertation the Dutch archaeologist, JG de Casparis connect this temple with the king of the dynasty Syailendra, Indra. In the inscription Karangtengah who’s down in 824 AD during the reign of King Samaratungga mention that King Indra, his father King Samaratungga, has set up a sacred building called ‘Venuvana’, which means bamboo forests. And according to Sri Pannyavaro Bhiku Mahathera in the narration in the video film documentary “Jewels of forgotten, Buddhist temples in Java” mentioned, the original name of this temple is ‘Venuvana Mandira’, which means palace in the middle of bamboo forests. When rediscovered in 1834, this temple was covered with soil and bushes. Like Borobudur, the temple is expected to also become victims mahapralaya gigantic eruption of Mount Merapi in 1006 AD So damaged overwritten ravaged Merapi volcanic material. And for centuries, this temple ‘sank’ swallowed era, along with the displacement of the center of the kingdom in Central Java to East Java. Efforts to clean and reconstruct the temple was performed on the Dutch colonial period in 1897. In the year 1901 until 1904, Brandes was not satisfied with the results of that and try to reconstruct. But work was halted before completion. So the effort to reconstruct the temple was taken over by Van Erp in 1908, together with efforts to reconstruct the temple of Borobudur. He managed to reconstruct this temple until the stage of preparing some of the roof of the temple. In 1925 several small stupa temple roof ornaments successfully reassembled. Voute Caesar in his book ‘Borobudur and Its Meaning’ mentions, Mendut located at the eastern tip an imaginary straight line from west to east along the nearly three miles across the river Progo and Elo, which connects the three temples of Borobudur – Pawon and Mendut. From Pawon, Mendut is 1150 meters, and distance Borobudur Pawon with 1750 meters. Many experts compare the archaeological site with the location of the Ganges and Yamuna holy rivers in India. Geographical conditions of this region, rivers are surrounded by mountains and hills is a place that is similar to the geographical conditions in India there. Maybe this is the major consideration of the kings of that time in choosing this place to establish the sacred buildings associated with his religion, Buddhism. Pawon is the name of a temple. Pawon redeveloped years 1903. Pawon name can not be known for certain of its origins. J.G. de Casparis interpret that pawon derived from Javanese Awu which means ash, A prefix pa and suffix Years which indicates a place. In the Java language of everyday words mean Pawon kitchen, But De Casparis perabuan interpret. Local residents also mentioned the name of the temple pawon Bajranalan. The word is probably derived from the word Sanskrit vajra = “Thunder” and anala = “Fire”. Inside this temple is not found anymore statue making it difficult to identify them further. An interesting thing from this is the variety Pawon hiasnya. Outside the temple walls are decorated with reliefs of biological tree (Kalpataru) lined purse and kinara-kinari (Half-human half-bird creature / human-headed bird body). Location of this Pawon lies between Mendut and Borobudur temple, Right away in 1750 meter from the temple of Borobudur and 1150 m from Mendut. Rice is the food Solo liwet the most famous, the food consisted of rice that is mixed with savory vegetables cooked squash in a little spicy, boiled eggs pindang, chicken disuwir, kumut ( sauce in coconut milk). Serve usually with banana leaves in pincuk (Javanese Language). 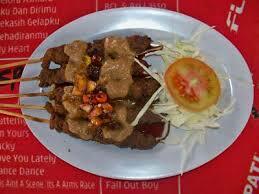 Goat satay skewers wrapping is typical Solo made from goat meat in minced, then the fuel and given a sate seasoning. Timlo only, East Pasar Gede-open hours 07:00 am and Jl.Urip Sumoharjo open hours 09:00 to 21:00 pm. Timlo Solo is a dish sauce nodes that contain a sausage chicken cut into pieces, boiled eggs and chopped chicken liver and ampela. These foods are usually in jajakan circumference. This food is comprised of diamond or often called gendar coconut and spices Cabuk Rambak use in cooking with sesame coconut milk, chilli, garlic, walnut, and brown sugar. This food is eaten with Karak (similar crackers made from rice). Tengkleng is a kind of curry goat food but do not use coconut milk broth. Contents tengkleng were goat bones with little meat attached, along with intestinal satay, satay viscera, and brain. Sate this puppy is unique because its main menu Tempe Gembus sate, is tempe made from the pulp remaining soy tofu, other than that there is also a satay beef offal such as lung, spleen, liver, iso, torpedoes, kidneys, tripe. Before the burning of food soaked in special seasoning. While the presentation using peanut flavor. Wedangan is one where people socialize Solo. Usually disajiakan merchandise in the cart or table a unique menu including lunch pack and side dishes such as tofu, tempeh, satay intestine, various fried foods, etc.. Visitors can freely take a side dish while in accompany with warm tea, coffee, or wedang ginger. Mang Restaurant Engking This originally was a place for the cultivation of prawns which was pioneered by two men who came from Sunda, namely Engking Sodikin and Mr. Ade. As I teach people about the cultivation of prawns, they then opened a shop which then evolved and became Mang Engking Restaurant. Special Waroeng Sambal – Waroeng SS was established in mid 2002 by Heri Yoyok Bulaksumur Wahyono in Yogyakarta with different service concept with shops or restaurants that already exists. The uniqueness of the concept developed by the owner was getting a good response from customers, including excess Warung Special Sambal on the quality of flavor sauce, chili menu offered variety, processing orders, based made to order, and orders the presentation of the procedures. Nanamia pizzeria – Pizza for Modern Traditional Pizza, The first time you hear his name sounds strange because of something that is synonymous with pizza Mamamia, not nanamia. Relax, nanamia is a name that is slightly diplesetkan course, because a merger sentence nanamia Mamamia with nana. Nana? Nana is Nanamia pizzeria restaurant name owner. Ayam Goreng Ny. Suharti is a restaurant that becomes one of the culinary destination that deserves to be tried in jogja. Its location at the fork in the road Babarsari Solo – Jogja. The diner who has the original picture was owned by Mrs Suhartinya Mrs. Suharti, fried chicken restaurant he was the first in Jogja. Resto Jejamuran with its unique motto ridiculous but delicious, if we try to think of where there is a ridiculous but delicious food? how ya? Direct mending you feel alone .. Jejamuran Resto Resto is specialized in providing the main food made from fungi like mushrooms tongseng, satay mushrooms, shitake pancakes, until wedang jejamuran also exist. This restaurant is located in Jejamuran Niron, Sleman, which is approximately 800 meters from the intersection Beran toward the North. Resto Jejamuran owned and managed by Mr. Ratudjo and managed with his wife. Tip Top Ice Cream already quite legendary and well known among the community of Jogja city, from small children to old people though. Tip Top Ice Cream, located on the road this Mangkubumi established since 1936. Ice cream menu, which is presented in the Tip Top Ice Cream at all because it’s very unique home made ice creamnya (handmade). The menu is presented at Tip Top Ice Cream, among others: the Mont-Blanc, Tutti-Fruti, Mont-Blanck, Cassata, a variety of Single Scope, and many more ice cream menu is worth your try. Meatball Malang Cak Masrur famous in Yogyakarta. Through Baksomu motto Choose Alone, you can select your own meatballs. Try your stop at the shop this Cak Masrur Meatball Malang . Cak Masrur who also works as the dentist was, bringing a special dumpling skins from Malang to get a taste of unique and delicious.There is a long fried dumplings, fried or fried round flowers. As for the fans jerohan cow, can select jerohan lungs and intestines fried bacem, there is also a kikil and tripe stewed with spices. For meatballs, meatballs can choose smooth or tendon meatballs. Enthusiasts meatball dumplings, meatballs can also get dumplings at this stall. Waroeng Steak and Shake already has five branches in DIY. 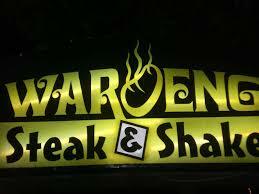 Waroeng steak is open from 12:00 am until 22:00 each day (Friday open at 13:00). Simple interior arrangement while still promoting a trendy and comfortable atmosphere for young people. Waroeng Steak offers a wide selection of special dishes from beef steak, chicken, fish and shrimp, as well as various beverages such as milkshakes and fruit juices. Food stalls typical Phuket Thailand which was located near the bridge this Lempuyangan, provide some kind of typical Thai food. The snack bar menu mainstay in Phuket Thailand is a typical chicken porridge phuket, Bangkok fried chicken, and grilled chicken phuket. The menu served is typical of Thai food that has been modified to tongue Indonesian people, but if you want to feel the genuine taste of typical Thailand, you can ask directly to the chef who has Thai blood. Iga Bakar Warung provide a menu such as grilled rack of spicy grilled ribs, honey-roasted ribs, grilled barbeque ribs, grilled ribs, garlic, black pepper and grilled ribs. In addition to grilled ribs menu, Iga Bakar Warung also provides a menu of soup, which konro soup, ribs soup, and soup vein. And you are concerned with high cholesterol, Iga Bakar neutralizing koresterol Warung provide refreshments, namely Honey Squash (drink honey mixed with lime juice) and vegetable juice or vegetable juice flavored mocha, melon, and strawberries. Restaurants Sekar Kedhaton is a restaurant located in the historic town of Kota Gede Yogyakarta which has a very unique place. In this Kedhaton Restaurants Sekar, guests can not only enjoy the best food but also can find an atmosphere of luxury and comfort with touches of a thick Javanese ethnic decorations. 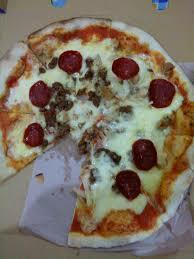 Papa Rons Pizza The first time was first introduced in Jakarta Fair, 2000 under the management of PT. Mitratama Setiamandiri language. In early 2000, Papa Rons Pizza began expanding its business openly with the franchise system in several cities in Indonesia. Seeing the rapidly growing franchise Papa Rons Pizza, PT. Setiamandiri changed its name to PT. Eatertainment International Tbk. assuming that can compete in the global market. Bale Raos, Royal Cuisine Restaurant is one of the few restaurants serving cuisine favorite Sultan of Yogyakarta, Sultan Hamengkubuwono of favorite dishes VII came to the Sultan Hamengkubuwono X. All the ingredients for these dishes come from herbs and traditional spices. Kapuas Estuary Restaurant – Fish, and Ayam Bakar Special is a specialist fish restaurant and grilled chicken. One of the recommended diet is ingkung chicken, fried tilapia, roasted sweet and sour carp, Wader fries, an assortment of hot sauce, kale cha. Gudeg pawon This has existed since 1952. Pawon name taken from the Javanese of the word “kitchen”, and also because the menu is served warm straight from the kitchen, where gudegnya cooked. Pawon including warm dishes warm dry, reddish brown gudegnya because flushing areh (already spiced coconut milk). In Gudeg pawon also provides a variety of complementary, such as chicken, eggs, tofu, and chili fries krecek. You must be patient a little because the applicants are very much Gudeg pawon because it is very well known in Yogyakarta. Liquid Club Cafe and Resto which is a tool Liquid Company owned restaurant located on Jl Magelang looks magnificent and crowded. Monday 9 June 2008 is a grand openingnya so visitors crowded the fair from 10 am until 3 o’clock in the morning. Liquid Club Cafe and Resto with Venua area that is clean, luxurious and of course with special menu2. Starting from the sea fod until European cuisine served here. with the room with transparent white glass and pampered by the friendly service, make love if you do not try Liquid Club Cafe and Resto. Pondok Cabe This presents a menu with 12 kinds of hot sauce choices are certainly very worthy for you to try, especially for you to sit and eat with a taste very spicy. Pondok Cabe has to choose his own concept of hot sauce like Warung SS, and a choice of sauces as much as the SS, the place is very comfortable and the price is quite cheap. Yu Djum Gudeg Kendil, which is located at Jalan Kaliurang, very famous in Yogyakarta. Yu Djum served with warm servings or Kendil besek. While the contents of Yu Djum Gudeg itself is sweet, Krecek, bacem Chicken Meat and Eggs. You also can choose according to your portion. Duck and Chicken Fried Pak Ndut This is the original from Kartasura which opened a branch in Yogyakarta, which is special about this diner menu in addition to the duck and chicken are a match sambel special. Duck and Chicken Fried Pak Ndut is open from 8:30 o’clock until 22:00 o’clock. 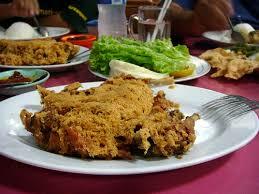 Duck and Chicken Fried Pak Ndut can also receive orders. Hotaru Japanese Rest is a Japanese cuisine restaurant special. Resto which has the motto Place Gather the family and the Japanese Community provides a variety of Japanese cuisine can shake your tongue like Cali Maki, beef Katsu, Yakiniku beef, Miso / Shoyu Ramen, etc.. In addition to providing Japanese food, Hotaru Japanese restaurant also provides various facilities such as Area Wide lesehan, Dojo Japanese martial arts, Counter Japanese fashion, Japanese accessories Counter, Counter Japanese martial art, Hotaru Member card, secure parking and spacious, Japan Regular Event, and many again. H. Fried Duck Original Slamet who exactly is on the road Gejayan / Affandi is a branch of Duck Fried Pak Slamet Kartosuro original address at Sedahromo RT.01/RW.07 Lor, Kartasuro, Sukoharjo, Central Java. Texture of fried duck into the main menu here is very soft at all, once bitten directly destroyed in your mouth. You can order one or even ducks per item (chest, thigh, head, rempelo ati, and to claw / chicken legs). H. Fried Duck Slamet has sambel mainstay matches which have been recognized a lot of people, which are presented to accompany the menu of fried duck. Peppermint Ice Cream Cafe is a cafe that provides the main menu of several kinds of ice cream, besides this cafe also provides a menu such as: Hot Dog, Burger, Fries Fried, and others. For you lovers of food is very sweet and people who are included in the category of “handyman snacking”, hehehe … You should try this place, suitable place to gather with family, friends, and your best friend. Kluwak Depot Java provides food with a recipe has been handed down, the menu of food that you should try Nasi Rawonnya certainly is, because it tastes delicious and fragrant. Menu rawon besides rice, among others: Rice Brongkos, suffocating Meat and Salad Solo.Kluwak Depot also provides some drinks, such as: Tea Sugar Rock, Rock Sugar Ginger, Ginger Milk Sugar Rock, Rock Sugar Ginger Tea, and Fresh Fruit Juice. Kluwak Depot also received orders for gathering events, gatherings, and other special events, also provide delivery service. Roast Chicken Mbah Purwo roast chicken subscription figure is the late Umar Kayam, and highly recommended by Mr. Bondan Winarno in Culinary show. Fried Chicken sell chicken grilled Mbah Purwo Klatennya, placed in tenongan (a kind of large basket made of tin). Roast chicken Mbah Purwo tastes very distinctive smell and flavor santannya “definitely” will arouse your appetite. Now this is only Mbah Purwo course, which still sells these baked chicken Klaten way as the original. Roast chicken can be from Mrs Mbah Purwo Bien already a few decades make this roasted chicken gagrak Klaten.